Cataracts Diagnosis & Care in Dallas, TX | Call Us Now! To the right is a picture of a cataract and some example lens implant styles. A cataract is the clouding of the lens in your eye. The lens both transmits and focuses light entering the eye on the retina, the back of the eye. The causes of cataract are many with the most common causes aging and excessive sun exposure. 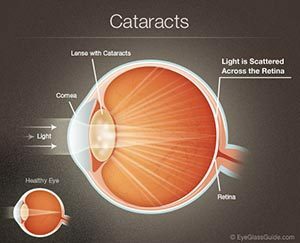 Cataract surgery is the most common surgical procedure performed in the United States with over three million performed yearly. The first lens implant used in cataract surgery was some 65 years ago but it was not until the early 1980s that the FDA approved implants for physicians to use at the time of cataract surgery. The Optometrists at The Eye Doctor’s Office since 1976 have diagnosed, treated and surgically co-managed thousands of patients with cataracts. Our role in the management and treatment of your cataract is to prescribe the best prescription eye wear to give you the best vision and monitor the progression of your cataract and eye health until the cataract matures enough to require surgical removal. As with Lasik, we are your advocates and will let you know when the surgical option is the best. We will not recommend unnecessary surgery and when surgery is the treatment choice we will refer you to one of our affiliated Ophthalmologists that are trained and experience to handle your case. Our affiliated surgeons use many different styles and models of implants. Along with your eye measurements and your expectations of vision after cataract surgery they will discuss the various choices and which implant is best suited for your best visual outcome. Because of that, we have chosen not to profile any specific brands and names of implants. We have access to all the latest implants and technology. Why choose us? We can assure you that you will be treated like family; we will be honest, be your advocate, treat you with respect, do the right things by you, always keep out promises and give you the best of care utilizing the latest technology. Our role after surgery is to provide all your post operative care in our office and in constant communication with the eye surgeon. 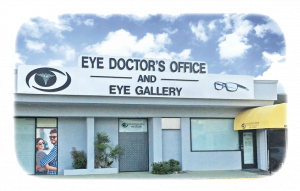 It’s a team approach and both Optometrist and Ophthalmologist provide your total care and practice the skills that they are trained in and enjoy performing the most. From time to time after cataract surgery we will suggest a minor and quick Lasik procedure to correct some residual uncorrected prescription and improve the post operative cataract vision surgery outcome. Modern cataract surgery has now become more advanced than robotic surgeries in which a computer program tells a laser where to make the surgical incisions without the eye surgeon having to touch the eye. FSL began its use in cataract surgical care in 2008 and brings increased precision to cataract surgery. The FSL is used for part of the surgical experience and robotically guides the surgeon in making precise accurate incisions in the cornea and the capsule that surrounds the cloudy lens material inside. In addition FSL uses lens (phaco) energy to fragment and liquefy the hardened cloudy material inside the lens capsule.